The goal of a posterior cervical laminectomy is to relieve pressure on the spinal cord caused by spinal stenosis. Stenosis is the abnormal narrowing of a body channel, and a posterior cervical laminectomy is a procedure that creates more room for the spinal cord. Skilled neurosurgeon Dr. Luis Manuel Tumialán uses a minimally invasive technique to perform the surgery through ports placed on the back of the neck. Benefits of this minimally invasive surgery include less tissue injury and a shorter hospital stay. To learn more about posterior cervical laminectomy, contact our Phoenix, AZ, practice to schedule your personal consultation. When Is This Surgery Recommended? Spinal stenosis commonly begins with disc degeneration. Typically occurring in patients age 50 and over, this spinal disorder is the result of repeated daily stresses and minor injuries adding up over time. As it progresses, multiple discs can bulge or become herniated, and the ligaments can be forced into the spinal cord or nerve roots. Spinal stenosis can also be the result of tumors, spinal injuries, excess ligamentum flava, bone spurs, and other obstructions placing pressure on the nerves. Spinal stenosis causes pinched nerves down the arm, as well as pinching of the spinal cord. The pressure on the spinal cord causes pain and can produce a lack of coordination and balance, as well as loss of hand function. 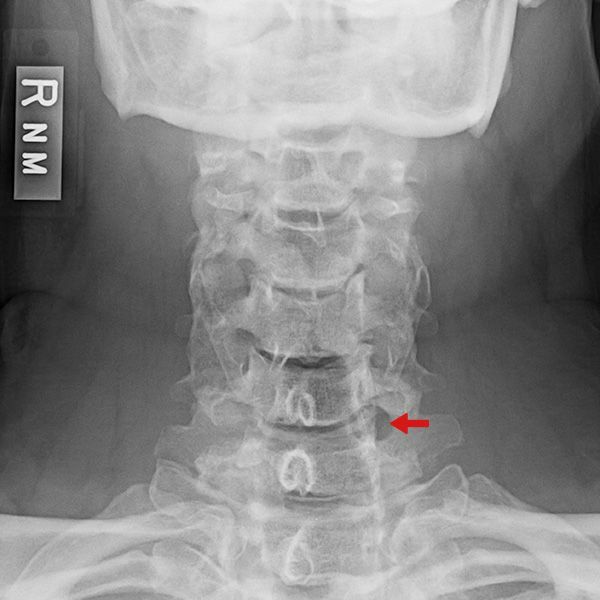 A posterior cervical laminectomy may be recommended when most of the compression is occurring in the patient’s back. The surgery is performed to give the spinal cord more room through the removal of a portion of the spine’s lamina. The lamina is a bony structure that helps provide protection for the spinal canal, as well as protect the back of the spinal cord. The spinal cord is particularly sensitive to injury, and the pinching can lead to significant loss of function. Since this loss of function may eventually be irreversible, it is important to correct the problem once it has been identified. Posterior cervical laminectomy is performed under general anesthesia. The patient is positioned prone (facedown) on the operating table, with the head and neck held securely in place by a special head holding device. Instead of creating long incisions, Dr. Tumialán uses minimal access ports placed through small incisions and secured in place by dilating the muscle. These ports allow him to access the lamina causing the compression of the spinal cord without causing any significant disruption of the spine. Dr. Tumialán strives to perform the best treatment for each patient, and in the most efficient way. When compared to traditional surgery, minimally invasive techniques provide a multitude of benefits. Using specially designed minimal access instruments and working with the illumination and magnification of an operating microscope, Dr. Tumialán is able to remove the component of the lamina causing spinal cord compression without disrupting the midline structures or the stability of the spine. Upon completion of the decompression the incision will be sutured, and the spinal cord will reposition naturally, now without compression. It is normal to experience some pain after surgery, especially at the incision site. Discomfort can be managed with medication. It is also common to feel tingling or numbness at the treatment area, which should diminish over time. Dr. Tumialán will provide specific instructions about post-operative care, and will talk to you about when you can resume your normal activities. Though results of surgery will vary depending on the extent of your case, most patients can expect improvement in their hand function, as well as their walking and balancing ability. Surgery should effectively reduce pain in the arms and shoulders caused by nerve compression. However, some pain in the neck may persist. Dr. Tumialán firmly believes in patient education and wants to make sure that all of your questions are answered when considering spinal surgery. To find out if minimally invasive posterior cervical laminectomy is right for you, contact us to schedule your consultation.